A few posts ago, I talked about my hesitance to work with a rattle during a trance exercise suggested in a book. Something about the context didn’t feel right to me. It just wasn’t for me. 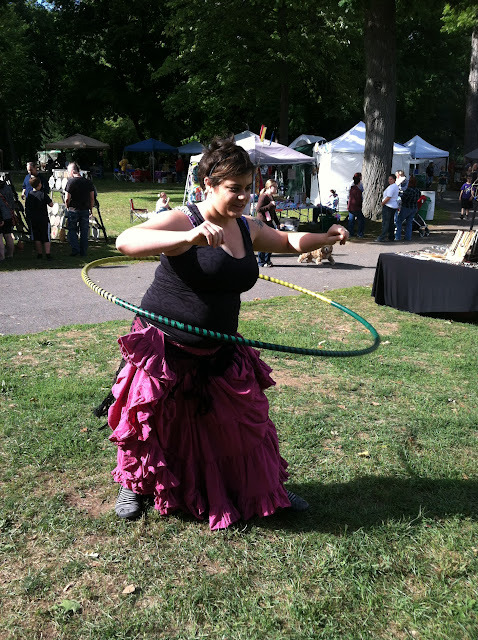 Well, I attended the Central New York Pagan Pride Day on September 17th and had an opportunity to try a rattle as I danced in a drum circle. It happened by chance – I was merely trying to encourage my daughter to try something and join me in the dance. After the fact, I researched the instrument and found that it’s called an ekpiri rattle. It was comprised of a wooden handle and various hard shells strung around it. It made a satisfying woody rattle. It’s apparently a common instrument in Ghana. As the drummers worked their magic, I danced with my daughter and some old friends in the circle. I won’t say that I went into any sort of deep trance – certainly not the kind I experienced at a Wellspring drum circle a few years ago – but I did find it remarkably easy to release worries and feel connected with the moment. I have a vivid memory of looking up at the tall oak tree above the circle. I admired it as I spiraled below, playing that beautiful African instrument. As I rattled and focused on the oak here and there, inspiration struck – why not make a rattle in a more Druidic context? I imagine utilizing wood found in Celtic lore- perhaps apple to represent sweetness and the Otherworld, or rowan for protection? 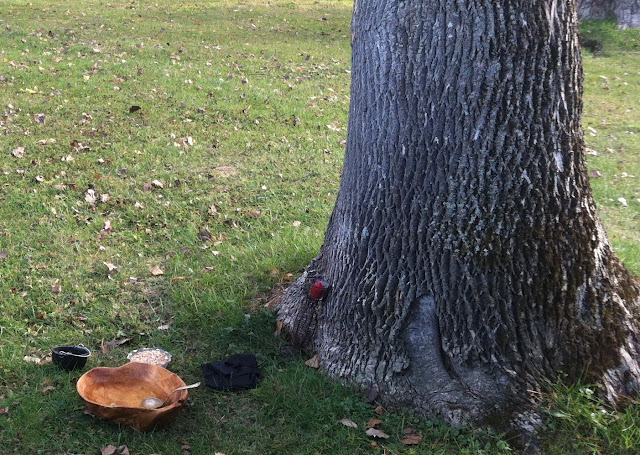 I imagine the percussive sound coming from acorn caps strung about the wood. And this is leading me to research rattles and their ritual uses in European cultures. Perhaps I should revisit my bell wand? This could be the start of something personally transformative… My trance studies are once more meeting with my casual love of dance while also appealing to my creative side. An image of the main ritual , a Keltrian Druid rite, from the Central New York Pagan Pride Day, 2012. Photo by Weretoad. We woke and dressed just before sunrise. It was going to be a long day. Skip and Sharon Ellison, the keepers of Muin Mound Grove, very generously offered us hospitality in their camper the previous night. We fell asleep to the music of heavy rain and, indeed, the ground was still moist when we emerged, ready to travel to Liverpool, NY. This year, my grove decided it would be fun to work together and show what our artisans are capable of, vend some wares, and provide information on ADF and Druidism. When we arrived at the Long Branch Park in Liverpool, we immediately got to work setting up a massive tent. I displayed my dolls, Phoenix hung her jewelry, and we showcased some of Dragonfly and Willow’s work. Soon we were joined by other grove members, old and new. It turned out to be a really fabulous day. The festivities began and ended with a spiraling snake dance and very, very casual Wiccan rite. I found myself swept away in a whiplash of joyful energy as we careened over the hills, through the tall oaks, and around the vendor tents. 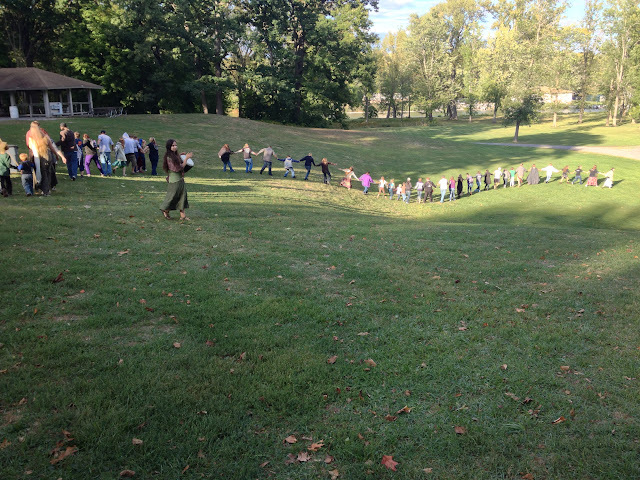 Laughing, grinning, and even tumbling down the grass, we joyfully welcomed a beautiful day full of learning, music, ritual, and camaraderie. Because I was vending, and I didn’t want to leave my husband alone too long*, I only attended one workshop – “The Tribal Origins of Sacred and Folk Music with John Hartford.” I’m glad that was the one I picked. He demonstrated several instruments and discussed the evolution of tribal music. I also learned some interesting things about Celtic instruments that I didn’t know before. I was very interested in attending the main ritual. It was lead by a Keltrian Druid grove from the Syracuse area. The Henge of Keltria seems more private than ADF, so while I was aware of this grove’s existence, I had never seen them or their rites before. Having grown out of ADF, I was curious to compare styles. There were some awkward moments in the rite, but I feel it was entirely due to being such a massive ritual. They are very difficult to lead! My favorite parts were the tartans worn by the members (showed a sense of community), their attention to lore, and their method of “recreating the cosmos.” My new friend from the North Country, RavynStar, came and we discussed some ideas for the North Country Druidic Study Group. Space set aside for a simple healing rite on the edge of Onondaga Lake. Photo by Grey Catsidhe, 2012. As the afternoon waned, our Senior Druid lead us to the edge of the park where the land met the Onondaga Lake, one of the most polluted lakes in the country. There, we partook in a simple healing rite. We offered song, spring water, and seeds to the local wildlife. We took care not to offer anything that would cause further pollution. The Senior Druid told the story of the lake which nearly moved me to tears. The omens spoke of further work to restore this body of water and the land. This poignant, quiet ritual was probably the most meaningful part of the festival to me. 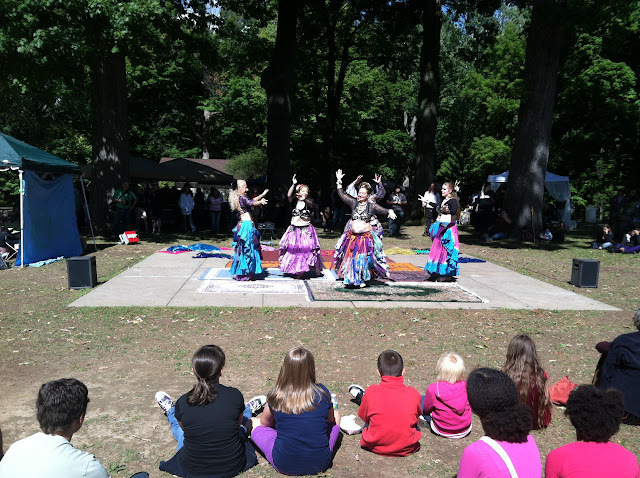 Other highlights included hooping, drumming, and a belly dance performance by Adi Shakti. As a vendor, I was pretty successful. I felt comfortable taking some of the money I earned and shopping for Winter Solstice gifts. Although it was a sunny day, the chill in the air whispered of winter. The wheel is turning, and Pagan Pride Day always ushers in the Autumn Equinox. It was fun to gather with other like-minded individuals, including old friends who I hardly ever get to see, and my grovemates. The memory will comfort me when this region’s Cailleach spreads her cloak of blizzards, isolating us until the thaw. * Bless my husband. He gave his entire day to helping me vend without any complaint. I’m a very lucky gal!